Heat olive oil over medium-high in a large skillet. 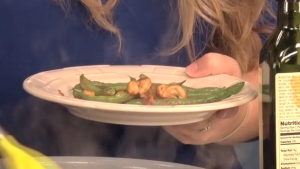 Add the green beans and cashews and cook, stirring often, about 4-5 minutes. Add the water and saute until it evaporates, about 1 minute. Add the chili- garlic sauce to the pan and cook, stirring often, until beans are coated, about 1 minute. Season with salt and serve.